As a kid, I used to play with words, testing them, exploring the possibilities of creating a secret language with friends. As I have grown through academia, I have found that my interests and talents lie in both English and linguistics, and I have desired to combine the two, to better understand the world around me. As a senior, majoring in both English and Linguistics at Haverford College (linguistics through Swarthmore College), I got the chance to take a closer look at this juncture, and have been captivated by the constructed languages (conlangs). J.R.R. Tolkien is known as one of the fathers of modern fantasy, but his stories are based primarily, as he claims, on the languages he invented, present in the novel. 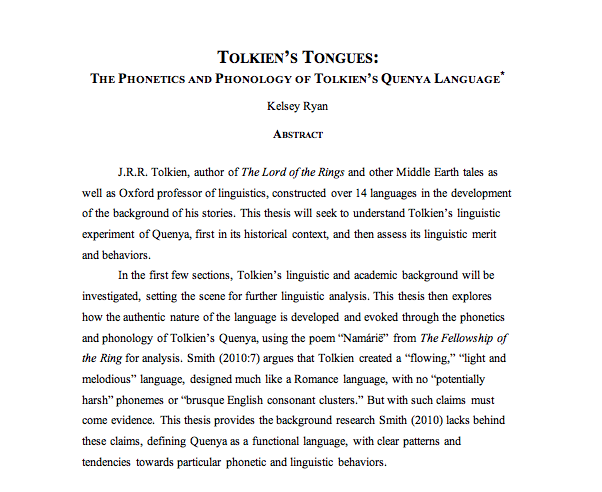 Tolkien’s conlanging imbues his stories and his life, and it has been my privilege to look at both the literary and linguistic sides of the language. My main focus has been on Tolkien’s Elvish language Quenya, as seen in the narrative through the poem “Namárië”. Out of this intensive yearlong study have come two complementary projects — one in each discipline. For full text, please contact me.